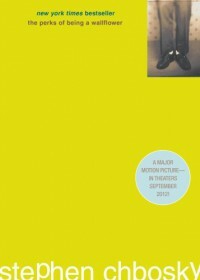 I originally read THE PERKS OF BEING A WALLFLOWER when I was a teen and remember being deeply moved. But beyond that, the book was a blur when I picked it up for a re-read recently. (I have a terrible habit of forgetting almost all details of a novel roughly 2-3 months after reading it.) Since it has been far more than 2-3 months since I was in high school and since this modern classic is headed to the big screen very soon, I wanted to give it another go. Once again, it struck a chord. I don’t think this is a perfect novel. Charlie sounds about 7 years old throughout most of it–a harsh disconnect from the brilliant, advanced student he truly is–and the opening pages are a bit overwhelming–they seem to throw every possible “issue” at you upfront, almost for shock value, when they could be woven in naturally as the story progresses–but I don’t care. Not in the slightest. Why? Because something magical happens as Charlie tells his story by way of letters to an unnamed friend: Intense Feelings. There are moment in this book that are so heart-breakingly real you can’t help but feel them between your ribs. I was transported back to high school reading this, couldn’t help but re-experience the highs, the lows, the pain, uncertainty, hope, defeat, and angst of being a teen. The scene where Charlie sticks up for Patrick in the cafeteria made me as proud as it likely did the first time I read it, even if it did simultaneously hurt like no other. And the evening they drive through the tunnel in Sam’s truck with the perfect song on the radio, feeling momentarily infinite = a hundred, thousand, million snapshots of my own childhood. This is truly a remarkable book. Can’t wait to see how Chbosky brings it to life on the big screen.